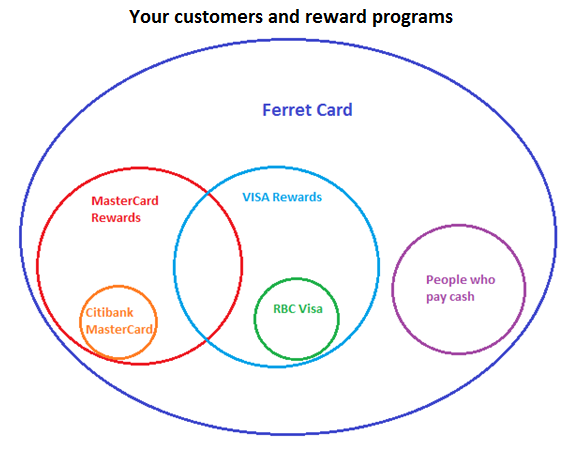 We want Ferret Card to be the world’s biggest rewards program. We want a Ferret in every store on Earth. And as part of that goal, we want you to understand our strategies, our beliefs, and to know why we do what we do. To be the world’s biggest rewards program, we must be completely NEUTRAL with regards to payment systems. Ferret Card users must be able to earn stamps regardless of whether they paid a merchant in cash, credit card, or magic beans. Why is this important? Because as a merchant, you don’t really care how your customers pay, so long as they are paying customers. A rewards program run by MasterCard will only benefit one subset of your customers. A rewards program for Citibank MasterCard will only benefit an even SMALLER subset of your customers. And at the end of the day, the goal of those programs is not to reward loyalty to your store, it is to reward loyalty to the card. Citibank and MasterCard want people to use their card, they don’t much care about whether people do that at your store or somewhere else. This is a conflict of interest between the merchant and payment processor, whereby each side has different goals. There are other companies out there as well who are working on the smart-phone loyalty program business, but as part of a payment solution. These include Square and Google Wallet. Again, these face the same conflicts of interest as any other payment processor loyalty program. Payment system neutrality is important for Ferret Card. We want people spending money in your store, and we don’t particularly care how they do that. Despite Ferret Card’s heavy focus on smartphones, we believe that technology should not be a factor in whether a customer can take part on Ferret Card. Customers who do not have a smartphone can just as easily use a physical Ferret Card, or can register online at www.ferretcard.com for the full benefits of having a registered account (sharing silver stamps, receiving specials, rating stores, etc). On the other hand, a merchant operating Ferret Card will need internet access at their point of sale to credit stamps to customers, and redeem rewards. We feel it is easier for the merchant to have their system ready and waiting, than to demand that all our users have the necessary gadgets to take part. It is easier to train a merchant, than to train every potential customer. Ferret Card is the online rewards program that even your granny can use! All things being equal, which reward is better for a merchant to offer: a $10 voucher for use at your own store, or $10 worth of products provided by a third-party rewards program operator? - rewards which come from a merchant help to build loyalty with the customer. A $10 voucher for use at your store means a very good chance the customer is going to come back again… and most likely spend more than $10! These are examples of other tools you can use to market to customers online and via mobiles, but are not capable of truly determining who is a loyal customer. Ferret Card rewards only real loyal customers. Stamps are issued by the merchant to paying customers only. In this way, the merchant is in full control of the rewards program. A special mention here is for Foursquare, in order to properly differentiate the way Foursquare thinks about loyalty, as compared to Ferret Card. Foursquare has the opposite approach to Ferret Card, whereby it is the customer who checks-in to a venue on Foursquare. The customer is in full control of the check-in. A typical “loyalty reward” on Foursquare may require a customer to check-in to your venue 5 times. In theory, this means the customer has visited your store 5 times. However, this does not mean that the customer has actually bought anything. Your most “loyal” customers may be your own staff, and the people who work in the vicinity of your store… regardless of whether they ever actually bought anything! Giving control of your rewards program to your customers in this way can lead to unexpected abuses, difficulty in controlling the cost of your loyalty program, and ultimately fail to reach your real loyal customers. How many individual store loyalty cards do you carry? How often have you forgotten to bring your card to a store? If the store loyalty program was UNIVERSAL, and could be used in many places, the chances of forgetting your card are reduced. If your store loyalty card is loaded onto your SMARTPHONE, the chances of forgetting your card are almost non-existent. A UNIVERSAL store loyalty card is one which is accepted at as many stores as possible. Ferret Card’s goal is to be the world’s biggest rewards program, with as close to universal acceptance as possible. In contrast with the above point, a rewards program also needs to be unique for each participating store. Each participating store needs the freedom to run the rewards program that best suits their business, allowing the individual store to build true customer loyalty. Whilst this may seem hard to reconcile with the need to be universal, striking the balance between these two needs is one of Ferret Card’s major strengths as a platform. Each participating store issues UNIQUE gold and silver stamps on Ferret Card, which cannot be used at other stores. Ferret Card itself is universal in that is can be accepted at many stores, but the stamps themselves are unique to each store. To tie in the universal and the unique is one of the role’s of the Stamp Exchange. This gives users the ability to trade the unique stamps from one store, for the unique stamps from another store. The merchant still retains full control, as the total number of stamps on issue from their store never exceeds the number of stamps they have issued. i.e. : A cake shop has issued a total of 10,000 gold stamps on Ferret Card. They have a reward, which requires 100 gold stamps to redeem 1 free cake. The store owners know that the MAXIMUM number of free cakes that could be redeemed are 10,000 / 100 = 100 cakes. The cake shop benefits from being part of a universal rewards program, while at the same time having full control over the rewards they are issuing. Not viral in the sense that our ferret is carrying the bubonic plague, but viral in the sense that users will attract more users, ad infinitum. This is the evil genius behind the silver stamp. By allowing Ferret Card users to share silver stamps with their 5 closest Facebook friends, they are directing those friends to also sign up for Ferret Card. If those friends don’t sign up for Ferret Card to claim these silver stamps, they’re missing out on FREE STUFF. And being a good friend, you don’t want your friends to miss out on free stuff, do you? Silver stamps are win-win for customers (more rewards), Ferret Card (more users), and merchants (more potential customers). Actually, so was the past. Your customers have always been talking to each other, and spreading word of mouth about your business, both positive and negative. The difference now is that we are all connected 24/7 thanks to the internet and social networks like Facebook. As a business, you need to leverage on your customer’s social connections to help spread the word about your brand. You want your customers talking about your store, and you want them to share how great you are with their friends. Of course, sometimes they need a little nudge to get the conversation going. This is why Ferret Card has baked in so many social functions, such as sharing silver stamps when you visit a store, sharing reviews with your friends, or sharing your favourite store once per week. Many businesses know that they need to get involved in social media somehow, but most either don’t know how, or don’t have the time to invest in it. Participating in Ferret Card is a short-cut to taking advantage of social media, by letting your customers do the talking. People are spending more and more time on their smartphones, as their smartphones increasingly do pretty much everything. Market research firm eMarketer reports that average daily time spent on mobile devices increased 30% in 2011 over 2010, reaching an average of 65 minutes per day. That is well ahead of average time spent on newspapers or magazines (http://www.emarketer.com/PressRelease.aspx?R=1008732). Businesses need to get their message across on this new medium. The market for advertising dollars on mobile devices is poised to explode, as advertisers have not yet caught up with new technology. As reported by eMarketer, advertising in newspapers or magazines is hugely disproportional to the actual amount of time spent with those media. 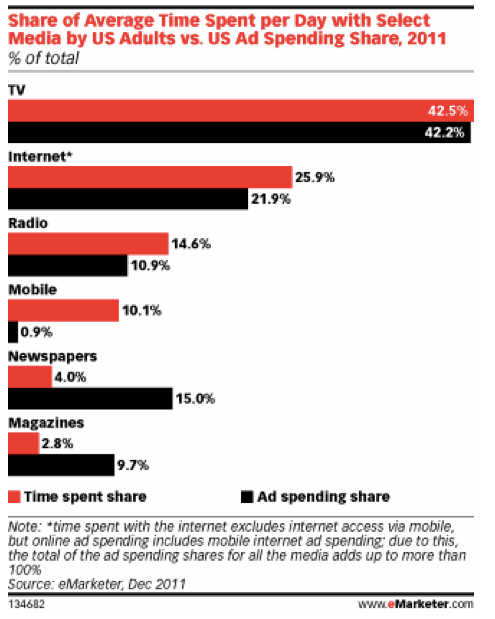 This only further highlights the HUGE potential for mobile advertising. Ferret Card stands to be a big winner in mobile advertising, by being a tool for any business (small or large) to be able to accurately deliver specials to their target audience. Ferret Card is able to do this by having access to a large database of users and their transactions, allowing us to deliver relevant specials to our users. Just as Facebook is able to deliver great targeted ads to its users by luring them in with a compelling product(the social network), Ferret Card is also able to deliver great targeted specials to our users by luring them in with another compelling product (Ferret Card Rewards). This is how Ferret Card will take its share in the mobile advertising market! Who are these funny people coming into your shop, taking your stuff, and giving you money? Shouldn’t you know more about what makes these people tick? That is exactly the point of Ferret Card CRM. We help you to keep track of the figures and statistics of your business, so you have a better understanding of your customers. Using this information, you can then better target your specials using Ferret Card Specials. We believe Ferret Card is in an ideal position to be able to generate reliable customer reports, as Ferret Card is open to all customers (regardless of payment method used). Additionally, reports generated by Ferret Card are likely to be more accurate due to customer’s linking their accounts to Facebook. On the other hand, you really don’t need to know everything about your customers. Ferret Card holds customer privacy in high regard, which is why Ferret Card CRM does not provide you information on any individual customers, only on your customers in aggregate. Ferret Card also does not offer any way to communicate directly to any individual customer, so it is not possible for a merchant to build up a mailing list to spam customers via Ferret Card. Nobody likes spam, and Ferret Card doesn’t want to be known as a company which facilitates unwanted e-mails!